This morning I attended a session at the CIPD conference where HRD’s shared their experiences of organisational transformation. One of those terms that sounds more fancy than it needs to. Change is all it is. A constant presence in all of the aspects of our lives. I’m not going all VUCA on you. This isn’t about the so-called changing world that we live in or the digital world and all that future of work stuff, it is just life stuff. When I hear people talk about change at work we often start from the premise that change is hard. Challenging. Emotion is always present. But which one? My experience tells me that there is no linear path. You can’t map it on a curve, and you certainly can’t predict how people will react when they hear the whatever it is. We all experience it differently. I have long given up trying to predict what someone will say or do when you sit down with them face to face whilst wearing your HR hat. What I do know is this: Change is hard. Sometimes it is other stuff too. Necessary. Cathartic. Liberating. Exciting. Frightening. Sometimes it is long overdue. A relief. Something to be thankful for. When it comes to organisational change there are no magic wands or silver bullets. What is needed isn’t all that difficult. Good and frequent communication. A human approach. Creating the vision of the future. A clear explanation of why and what and when. Ownership and responsibility. Help with the emotional stuff for those that need it. Quickly addressing the hygiene stuff. Answering the questions that are asked with transparency and speed. Honesty about what is known and not known. For HR specifically; the need to be present, visible, available. We need too a recognition that change doesn’t always mean something negative. If we approach it as such then this is the reality we may create. There will always be emotion to play out, this is just how it is. But remember that change, whatever it is, might just be the best thing that could have happened, for the individual or for the organisation. Well, here I am again. At the CIPD Annual Conference, with the honour of being part of the social media dream team. It’s keynote time, and we are listening to Dr Margaret Heffernan, award winning author and Ted speaker, on collaboration, innovation and creativity in the new world of work. What makes modern organisations successful? Here’s a little of what she had to say….. Successful teams aren’t those who are the smartest. Who have the highest IQ – or even one or two members with high IQ. Just having a bunch of smart people won’t lead to organisational success. Neither will having one superman. Research into successful teams found that they have three characteristics: people within it score high on empathy, they have contributions from everyone in the team and they had more women within them. This equals collective intelligence. What matters is what happens between people. Helpfulness. This is the key, in any type of organisation. Simply, how helpful people within the organisation are to each other. Helpfulness has power. It leads to confidence. Fundamental to it is the idea of sharing information. This is what people do when they are helping each other. It plays out by people spending time together and sharing. Research shows that work groups that take coffee breaks together become significantly more productive. It’s about spending time together. It is internal networking. Relationship building. Building too the collective intelligence of the organisation. But sometimes the hierarchy and bureaucracy gets in the way. Structures can impede productivity and problem solving. They block the information. We have to get round them. You can measure the health of an organisation by how quickly important information flows. Social capital. The idea that the social network is central. That there is, within the organisation, trust, reciprocity and co-operation. Shared consciousness. This is the key to organisational success. People that are successful in complexity? People who listen. Who ask good questions. Can pick up all the weak signals within the organisation. Who get outside their own field of expertise. These are the people that can solve the problems. The problem for our organisations is unlocking people’s thinking. Getting them off their particular piece of the chessboard (the job description, the fixed title and place in the organisation chart). We spend so much time thinking about performance management and weeding out the slackers, but that is a 5% problem. Instead we need to focus on the 95%. What is important that people feel valued. Where they can make mistakes because that equals learning. And when people understand that they are there to learn. It’s not about HIPOS. It is seeing talent everywhere. Talent is not fixed. Expertise is not enough. We need people who are enthused by learning. We need to reframe and re-tackle the issue of diversity. We need to cherish the differences between people. The people that are not like you have. I have to teach you. When we recruit people stop digging into their expertise. Ask them who helped them get where they are today. Hire people who share what they learn. Hire their social capital. We need curious minds. Well stocked minds. Diverse minds. This way leads to success. Organisations will only grow when our people grow. Margaret quoted all the research that backed up the findings. But even putting that aside, we know this don’t we? As HR professionals? I’ve worked in organisations where people aren’t helpful. Where they put up barriers. Where the answer is no, know what is the question. Where people would rather win or score points than work collaboratively. Where people quote policies or hoard information. Information does not flow. These organisations are not good places to work. And of course there are negative impacts on productivity. This stuff is circular. If people don’t help each other, there isn’t trust. There isn’t reciprocity or sharing. There is no learning g. So how can there be innovation? High engagement? Growth – of individuals or EBITDA? Social capital is the formal name for something more simple. Relationships. People. Being human. And this is what we do in this profession of ours. This is our opportunity. Back to that coffee break thing…. Where I work we are big fans of Fika. Google it, try it, have coffee together. This is a live blog. Please excuse any typos! It’s nearly that time of year again. When the great and good of the HR world converge on Manchester like employees around the free fruit on wellbeing day. If you are coming along to join in with all the fun serious learning then here are my top 10 best free bits for your conferencing pleasure! Head to the People Management drinks on Tuesday evening if you are getting there early. There is wine. Hopefully. Check out the IIP exhibition stand. I have no idea what will be on it this year, but it’s usually a good one. And they mostly have cupcakes too. Check out DPG in the exhibition too. More often or not there is some good conference swag to be had – and usually a handy bag to carry it all in too. Get yourself some of that conference swag. It’s time to stock up those stationery cupboards people! On Wednesday night head over to Tribeca Bar in the Northern Quarter. You will find fellow blog squad member Tim Scott showing off his other talents by DJ’ing the night away. Play ‘blog squad bingo’ and aim for a selfie with the whole gang! Check out HR Unscrambled breakfast meet up on Thursday morning to discuss all things that matter to you and help shape the future of HR. Check out the free learning programme for a mahoosive 60+ sessions that are all, well, free. Network! As well as all the social stuff that will help you meet other HR types, there’s some formal opportunities as well. Start early by getting on all the social feeds in advance. Tweet. Obvs. Don’t forget the hashtag…..
See you there folks – IRL or via Twitter! When you have been conference blogging, it is customary to write a post a short while after the event, usually sharing a little of your reflections or learning. Instead, this time, I’m handing over my blog to someone else to do this task. Amelia joined my company a little under two months ago as an apprentice in all things people stuff. She has just attended her very first CIPD ACE, and this is what she got up to while she was there and what she thought of it. It was better than I expected, even though I wasn’t sure what to expect! I had been looking forward to it in advance, because I’d heard good things from the team, so I didn’t even mind getting a VERY early train. As soon as we walked in I was handed a bag and a lanyard, which was the first of loads of cool free stuff – I have developed new muscles in my arms from carrying it all home. To be honest, I wasn’t sure if I’d find it interesting or if most of it would go over my head, but I met lots of people who were all happy to chat and were interested in what I had to say too. I went to some of the free learning sessions – the best was one about the power of thank you and making it personal for the individual and not the same for everyone. I was introduced to lots of people by their Twitter handles, so I have no idea of their real names. I keep hearing that some people don’t like HR people, but everyone I met was really nice, including the people who let me into the members lounge for a coffee, even though I am not a member – yet!! The best thing about the conference was winning a goodie bag with a hoody from Oracle, and meeting Peter Cheese and managing not to say anything embarrassing. 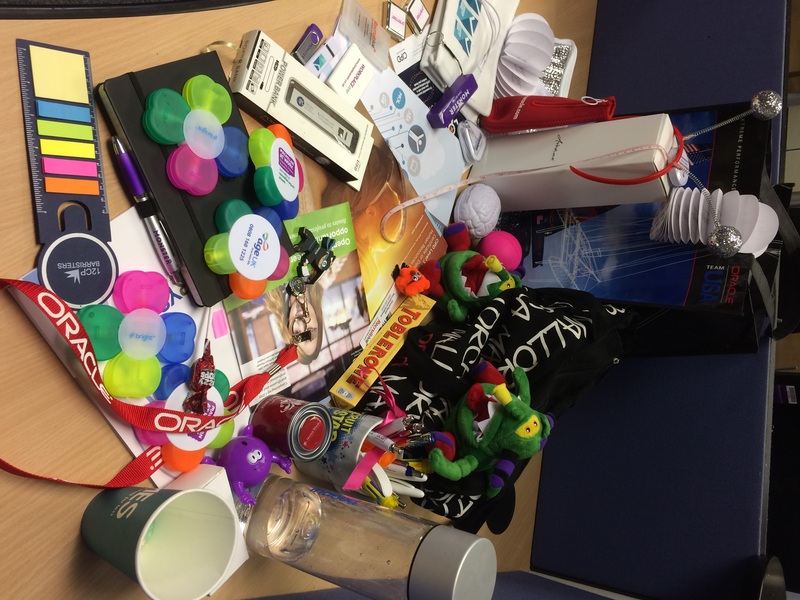 I’ve now got a desk full of conference goodies including some silver deely boppers that I stole from Gemma. Oh, and plenty of emails coming through from people that I met on the day! I will definitely be back next year, and as Peter said he was sure Gemma would turn me into a blogger, I might even blog it next time. How do you develop a leadership culture that can support organisational change? Some might say this is the million dollar question for most organisations; change is part of the everyday for work and workers. Here is what Inji Duducu of beneden health and William Hague (not that one) from HMRC have got to say on the subject, based on their own experiences. William is Chief People Officer at HMRC. First of all, great HR is an enabler of creating the right leadership culture for successful change. I’m not going to argue with that. At HMRC they have had big challenges. A need to reduce costs, be more efficient, transform service delivery, and at the same time, increase capability and use of digital services. They needed leaders up for the challenge, with the ability to reach out last their traditional boundaries and collaborate. Their starting point – what does good leadership in this context actually look like? Obvious, but important. For them it was three things: inspiring, confident, empowering. ICE. Easy to remember but also queues up a Vanilla Ice joke (one for the Gen Xers). How did they tackle this? They had a leadership change model – building our future. Went out to every leader face to face. One narrative about the future to over 100,000 people. Significant investment in upskilling leaders. A leadership academy is planned with five years of interventions, including virtual learning. Taking a long term approach. Extensive engagement with their people. Expected their managers to live this change. Have used surveys regularly to see where they are. They are not there yet, but are focused on continuous improvement in everything they do. They have had many learnings. Mainly – there is no silver bullet to tackle this stuff. And finally, be ambitious. Now over to Inji for her story. Beneden started life as a mutual society, focused around public sector workers who bad contracted TB. Today, they provide healthcare solutions to enable people to access treatments faster than the NHS might be able to provide. They were losing members. It was a difficult product to explain and not enough people had heard of them or what they do. A new CEO launched a ten year plan. The average length of service at Beneden is 20 years; many employees had simply never experienced any change at all. Inji’s plan? It is a special place to work with a special culture. Her aim is that at the end of the ten year plan, this has not changed even if it other things have. One important focus – leadership visibility. People see where leaders spend their time. It sends a message about what is considered important by the organisation. Another quick win was celebration. Celebrating what is going well, and organisational achievements. Find stuff to celebrate – what gets recognised gets repeated. They launched an online appreciation hub for people to send ecards to each other. It has gone down a storm. Provided a cultural boost but it is digital, which is the sort of business they want to be. Inji also saw their values as generic. They could have applied to anyone. Needed to discover what their real values are. Looked at the future and heritage to talk about what is their core – what makes them special. They distilled down the feedback into four values that really summed up who they are. They needed to tell a story about their future. They took their behavioural framework and turned it into a programme for their leaders ‘leading the Beneden way’. Challenging programme beginning with self awareness and self mastery. Right now, the organisation is not only coping with that change but thriving. Her learnings – fundamental importance of communication. Find the good news – give people reasons to be cheerful. This will give you more capacity for change. Inji’s story proves that change doesn’t have to be a scary thing that we liken to the emotions more usually prompted by bereavement. It can be a positive experience for the people within it, if you manage and lead it well, as well reminding us of the fundamental role that HR can play in making it so. This is a live blog so please excuse any typos! Organisational Structures. Time for change? I’m blogging from a session entitled ‘Hierarchical Structures v Organisational Freedoms’. Tim Scott and Andy Swan are presenting their thoughts, Ignite Style. When it comes to the way we organise organisations, for the most part little has changed in years. The technology looks very different, some of the practical ‘how’ has changed, but the other stuff…. not so much. Managers, middle managers, top down, bureaucracy. Teams organised by function, sitting in an org chart, focusing on their own stuff. Occasionally, alternatives are talked about and tried. Take the latest kid on the block; holocracy. Leading the way with the holocracy movement is Zappos. The experiment has spawned more articles, blogs, conference sessions and opinion pieces since… well the last big bandwagon. Leading the way with the holocracy movement is Zappos. The experiment has spawned more articles, blogs, conference sessions and opinion pieces since… well the last big bandwagon. In the blue corner, is Tim. He’s arguing for the traditional organisation. He wants us to gather around his desk. He isn’t bothered about being trendy. There are good things about being in a hierarchy. It isn’t about defending scientific management or old fashioned practice. The best of managers can be inspiring within a hierarchy. You don’t get that within a committee. A good manager can give you focus. They give you over head cover and clarity. Management as a structure is clear. People know where the buck stops. How do structures like holocracy work in the real world, especially the public sector where someone has to be accountable? It is a human trait to like structures. Just like a book, we are familiar with it and know how it works, traditional or not. Have you seen a holocracy constitution? Goes on for ever. Still very few organisations are using it. Management is flexible. There are bad management practices – but we don’t need to throw away the baby with the bath water. Unlocking organisations through trust and freedom. 87% of people are not fully engaged according to Gallup. Holocracy still has structure, just not a typical one. He’s not a fan specifically, but he is a fan of setting people free and evolving businesses. We live in a world of cycles. Minimum viable product. So we need constant innovation. We need to allow people to contribute as this is what engages them. Power in a hierarchy sits at the top. Ideas might be the bottom. They can’t get from one to the other. Instagram had 13 people but have survived and flourished when Kodak died. Ditto Netflix and Blockbuster. Alternative structures creates equality and encourage information flow. Fluid. Quick decision making. Collectively people are powerful. Every organisation is unique as are the people within it. This isn’t about throwing everything away and creating chaos. Traditional organisations are based on control, suspicion and secrecy. Approaches like holocracy allow freedom within parameters. Lead by example vs manage by spreadsheet. I’ll confess. I’m a cynic about holocracy. So it appears where some of the employees from Zappos itself. When the experiment was launched, employees were given the opportunity to leave if they didn’t want to work within it. Some 14% apparently did so. There are things we need to change about how we work. I am just sure that hierarchy is currently top of my list. What becomes of the Zappos experiment will remain to be seen. My cynicism may prove to be unfounded, or perhaps just a ludditesque rejection of change. But when it comes to these alternative structures, just maybe the cure for these organisational challenges we are trying to solve, is worse than the disease itself? As this is a live blog, please excuse any typos! …. is the basis of Sir Clive Woodward’s speech to CIPD15 delegates today. Woodward is the former head coach of a world cup winning rugby team, England international and Team GB’s director of sport for the British Olympic Association. The business and sport analogy is nothing new. Much has been written and said on the subject. There are plenty of parallels. The need for effective team work, strategy, leadership for success in both. The focus on performance, both individual and team. Woodward is going to share with us today about what he believes is the DNA of a champion. His first slide simply says: Great teams are made of great individuals. His view – talent is the starting point. But you also need character, criteria and coaching. The talent needs the ability to learn – people must have the thirst for learning to be successful. They must be a sponge not a rock. Make people sponges not rocks. Whatever that means. People need to take individual responsibility for their own learning, not sit back and wait for HR. This is what talent does – it constantly keeps on learning. We then turn to warriors and t-cups. Warriors can perform under pressure. A t-cup stands for ‘thinking correctly under pressure’. A champion is a warrior who can cope under excess pressure even when something unexpected happens or in the face of adversity. Then, it’s attitude. Woodward’s definition of attitude: punctuality, trust, obsession, responsibility, collaboration, beyond number one, enjoyment. He firmly believes attitude can be coached. The chapters in his metaphorical book on talent; capture knowledge, collaborate, cultivate learning, convert to know how. Woodward argues that you can be very talented but you need other things too if you want to be a champion. His final requirement for the DNA of a champion? Hard work. It’s hard to vehemently disagree with some of this….. But some of the labels don’t really work for me. It reminds me too much of the whole high performers thing. I’ve always been uncomfortable with labelling people as top talent. Because what about everyone else? What about people who struggle to learn, and so on. Ditto when companies take the top ten sales people on some fancy foreign holiday as part of an annual recognition scheme. What about the people who are left behind in the office, or simply those who don’t identify with words like champion or talent? Over focusing on just talent can exclude. This is when the sport / business analogy breaks down for me. Talent, and being a champion, is contextual.